Oil was buoyed by the prospect of shrinking US stockpiles and wider financial-market optimism spurred by a new US-Mexico trade pact. While futures in New York held gains near $69 a barrel, global benchmark Brent crude in London traded above $76 and was at the biggest premium in over two months to the American marker. US crude inventories are forecast to have fallen further last week after slumping more than expected in the seven days ended August 17. Oil is joining risk assets across the globe that are getting a boost after America sealed a bilateral trade deal with Mexico. “The US reaching a new Nafta agreement with Mexico is improving the overall market sentiment, which has been supporting oil prices,” Ahn Yea Ha, a commodities analyst at Kiwoom Securities, said by phone from Seoul. There are still causes for concern, though. New York futures have traded below $70 this month on concern that trade tensions between the US and China could weaken global economic growth and sap energy demand. American President Donald Trump said it’s not the right time for trade negotiations with the Asian nation, denting expectations for a near-term deal after the breakthrough agreement with Mexico. Investors are also closely watching whether the Organisation of Petroleum Exporting Countries and other producers will boost output to fill in a potential supply loss when renewed US sanctions on Iranian crude exports start in November. • West Texas Intermediate crude for October delivery was down 7 cents at $68.80 a barrel on the New York Mercantile Exchange at 08:58; total volume traded was about 52% below the 100-day average.Contract added 15 cents to $68.87 on Monday. • US crude stockpiles are expected to have fallen 1.49 million barrels last week, according to a Bloomberg survey before government data due Wednesday. 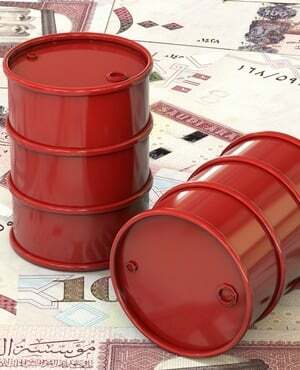 They fell 5.84 million barrels the week earlier, against expectations for a 2-million-barrel slide Brent crude for October settlement added 3 cents to $76.24 a barrel on the London-based ICE Futures Europe exchange. • Prices on Monday climbed 39 cents to $76.21. The London futures traded at a premium as high as $7.45 to WTI, the most since June 22 December futures in Shanghai gained 0.2% to 512 yuan a barrel, after slipping 0.2% in the previous session. • Saudi Arabia has granted its state-owned oil company a 40-year concession to exploit the kingdom’s hydrocarbon reserves as part of Aramco’s preparation for a potential initial public offering, a person familiar with the matter said.